Maine Class Battleship: Displacement 12,500 Tons, Dimensions, 393' 11" (oa) x 72' 3" x 26' 8" (Max), Armament 4 x 12"/40 16 x 6"/50, 6 x 3"/50 2 x 18" tt. Armor, 11" Belt, 12" Turrets, 4" Decks, 10" Conning Tower. Machinery, 16,000 IHP; 2 vertical, Inverted, triple expansion engines, 2 screws. Speed, 18 Knots, Crew 561. 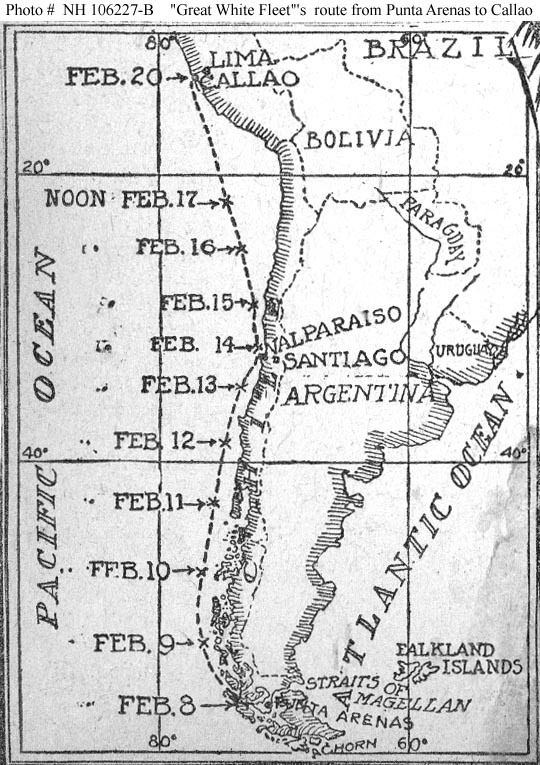 Operational and Building Data: Laid down by Cramp, Philadelphia February 15 1899. Launched July 27 1901. Commissioned December 29 1902. 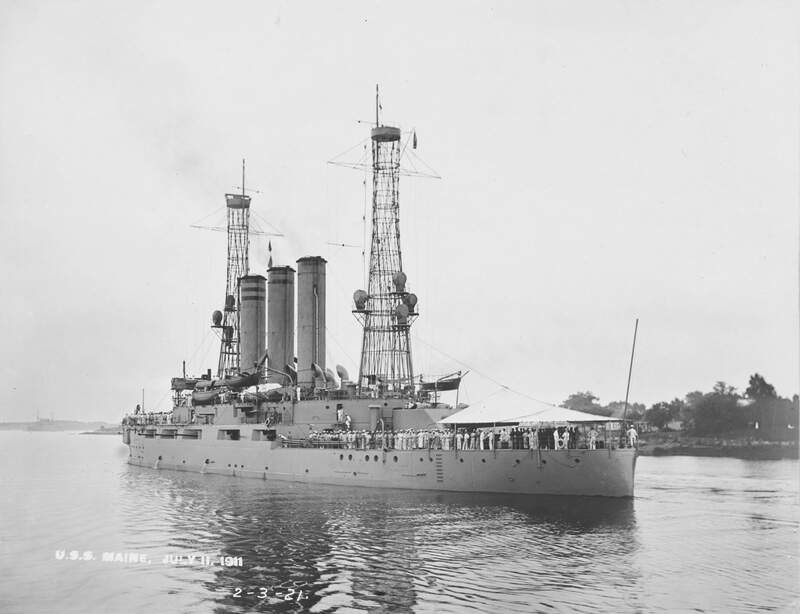 Decommissioned August 31 1909, Recommissioned June 15 1911, Decommissioned May 15 1920. Stricken July 1 1921. Fate: Sold January 26 1922 and broken up for scrap. 1.52k THE NEW BATTLESHIP MAINE (BB-10). From an illustration in Leslie's Weekly Image and text provided by Library of Congress, Washington, DC. Photo courtesy of The National Tribune. (Washington, D.C.) 1877-1917, 01 December 1898, Image 6, via chroniclingamerica.loc.gov. 3.81k THE MAINE (BB-10), ONE OF THE NEW BATTLE-SHIPS RECENTLY CONTRACTED FOR. The Navy Department Decided That One of the New Battle-Ships Authorized by Congress Should be Named the Maine. The Others Are the Missouri (BB-11) and Ohio (BB-12), the Latter to Be Built at the Union Iron Works. 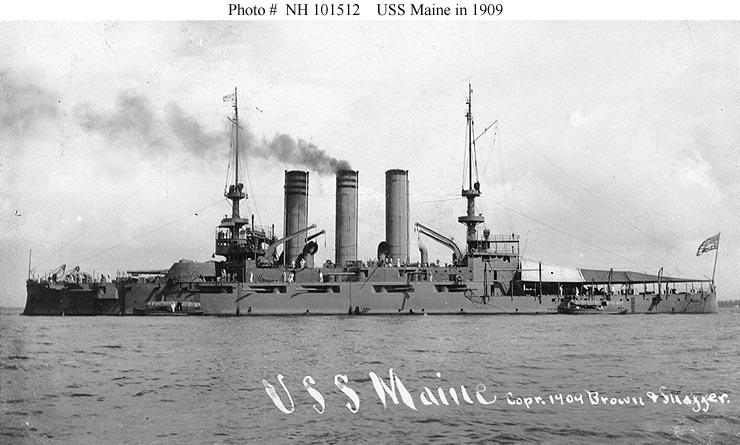 According to the Secretary of Navy's Report the Maine Will Be Ready for Service 1 June 1901. Image and text provided by University of California, Riverside. Photo courtesy of The San Francisco Call. (San Francisco [Calif.]) 1895-1913, 04 December 1898, Image 2, via chroniclingamerica.loc.gov. 620k The keel of Maine (BB-10) lies mainly on the plain. USN photo # 19-A-0001, from NARA, College Park, Maryland, courtesy of Sean Hert. 3.75k NEW BATTLESHIP MAINE (BB-10), AS SHE WILL APPEAR WHEN COMPLETED. Image and text provided by Minnesota Historical Society; Saint Paul, MN. Photo courtesy of The Saint Paul Globe. (St. Paul, Minn.) 1896-1905, 05 February 1899, Image 6, via chroniclingamerica.loc.gov. 802k THE OLD AND THE NEW BATTLESHIP MAINE (BB-10). The new battleship Maine, the keel of which has just been laid, is to have a speed of l8 knots. She will be a ship of 15,500 tons displacement and in her main battery will carry four 12 inch guns and twelve 6 inch guns. These figures give a partial idea of the superiority of the new Maine over the old one. 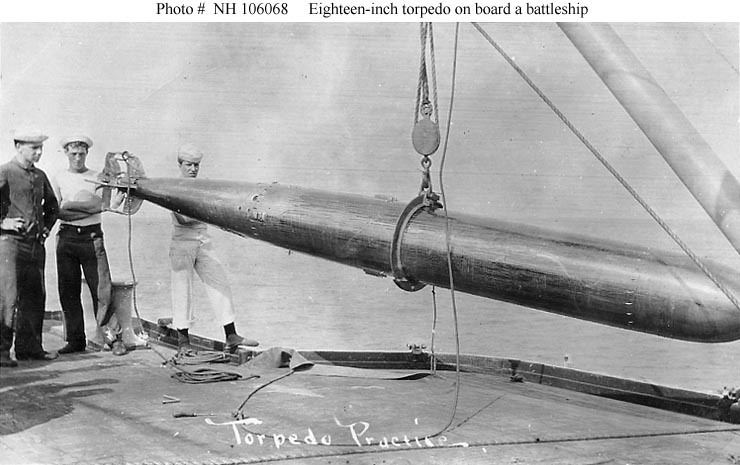 Among other things the new Maine will probably have underwater torpedo tubes, the first ever put in any ship in the American navy. All the guns of the Maine, except the big 12 inch ones in the turrets, will be of the rapid fire pattern. Her secondary battery will be exceptionally strong. She will be 368 feet on the water line, 27 feet beam and will have a draft of 24 feet 7 inches when she has full supplies of stores and ammunition and 2,000 tons of coal on board. The wonderful Krupperized armor has proven so good that the Maine will have 12 inch plates of it put on her instead of the 16.5 inch Harveyized armor originally planned for. Image and text provided by Library of Virginia; Richmond, VA.
Photo courtesy of Virginian-Pilot. (Norfolk, Va.) 1898-1911, 17 February 1899, Image 1, via chroniclingamerica.loc.gov. Battleship Maine (BB-10), in Course of Construction. Image and text provided by University of California, Riverside. Photo courtesy of The San Francisco Call. (San Francisco [Calif.]) 1895-1913, 26 July 1899, Image 3, via chroniclingamerica.loc.gov. 81k Maine Class Battleship Pen and ink drawing by F. Muller, circa 1900, representing the intended appearance of the three Maine Class ships once completed. These ships were: Maine (BB-10), Missouri (BB-11) and Ohio (BB-12). Courtesy of the Navy Art Collection, USNHC # NH 76392. As the date for the christening of the battleship Maine approaches popular opinion here becomes stronger daily that the honor of shattering the neck of the champagne bottle on the craft will fall to the lot of Ethel Sigsbee, daughter of Captain Charles D. Sigsbee, who commanded the ship's ill-fated predecessor. Image and text provided by University of California, Riverside. Photo from The San Francisco Call. (San Francisco [Calif.]) 1895-1913, 19 May 1901, Image 15, via chroniclingamerica.loc.gov. 745k Detail from panorama of the William Cramp & Sons Ship and Engine Building Co. looking east across the Delaware River from Kensington, Philadelphia. 27 July 1901. Spectators have gathered for the launch of the second U.S. battleship Maine (BB-10) (foreground). Photo by Jeff Hurwitz from the Atwater Kent Museum Collection of the Philadelphia Maritime Museum. 3.01k The battleship Maine (BB-10) strikes the water for the first time. Image and text provided by Library of Congress, Washington, D.C.
Photo by New-York Tribune. (New York [N.Y.]) 1866-1924, 28 July 1901, Image 1, courtesy of chroniclingamerica.loc.gov. NR Captain Sigsbee, Who Commanded the Old Maine in Havana Harbor, Witnesses the Christening of the Ohio's (BB-12) Sister Ship at the Cramps Ship Yard by Miss Mary Preble Anderson. New Warship Represents Another Step in the Development of the Steel Battleship. Image and text provided by State Historical Society of Missouri; Columbia, MO. Photo courtesy of The St. Louis Republic. (St. Louis, Mo.) 1888-1919, 28 July 1901, PART III, Image 21, via chroniclingamerica.loc.gov. 1.88k NEW BATTLESHIP MAINE (BB-10) GLIDES FROM CRADLE AND IS SUCCESSFULLY LAUNCHED AT THE YARDS OF THE CRAMPS AT PHILADELPHIA. One of Largest Crowds That Has Ever Seen War Vessel Leave Ways at Cramps Makes Patriotic Demonstration in Honor of Ship That Will Replace Ill-Fated Craft Whose Shapeless Mass Lies in Havana Harbor. Image and text provided by University of California, Riverside. Photo by The San Francisco Call. (San Francisco [Calif.]) 1895-1913, 28 July 1901, Image 13, courtesy of chroniclingamerica.loc.gov. 245k LAUNCHING A BIG BATTLESHIP. How a Battleship Looks When She Slides Into the Water Image and text provided by University of Utah, Marriott Library. Photo by The Coalville Times. (Coalville, Utah) 1894-1923, 30 August 1901, Image 6, courtesy of chroniclingamerica.loc.gov. 165k New battleship Maine (BB-10), building at Cramp Works, Philadelphia / Fred Pansing. Digital ID: 3g03271v, LC-B2-2332-14. Source: Library of Congress Prints and Photographs Division, from the George Grantham Bain Collection, courtesy of Tom Kermen. 306k Maine (BB-10) flies the flag of Cramp. Photo courtesy of the Boston Public Library, Leslie Jones Collection via flickr.com. 3.07k THE NEW MAINE (BB-10) ARRIVES. BATTLESHIP TO TAKE PLACE OF ONE BLOWN UP AT HAVANA RECEIVED A ROUSING WELCOME. Image and text provided by Library of Congress, Washington, DC. Photo by New-York Tribune. (New York [N.Y.]) 1866-1924, 18 August 1902, Image 3, courtesy of chroniclingamerica.loc.gov. New Battleship Maine (BB-10) Fails in Speed Contract. Unable to Average the Eighteen Knots Required. Overconfidence of the Builders is the Cause. Image and text provided by University of California, Riverside. Photo courtesy of The San Francisco Call. (San Francisco [Calif.]) 1895-1913, 31 August 1902, Image 1, via chroniclingamerica.loc.gov. 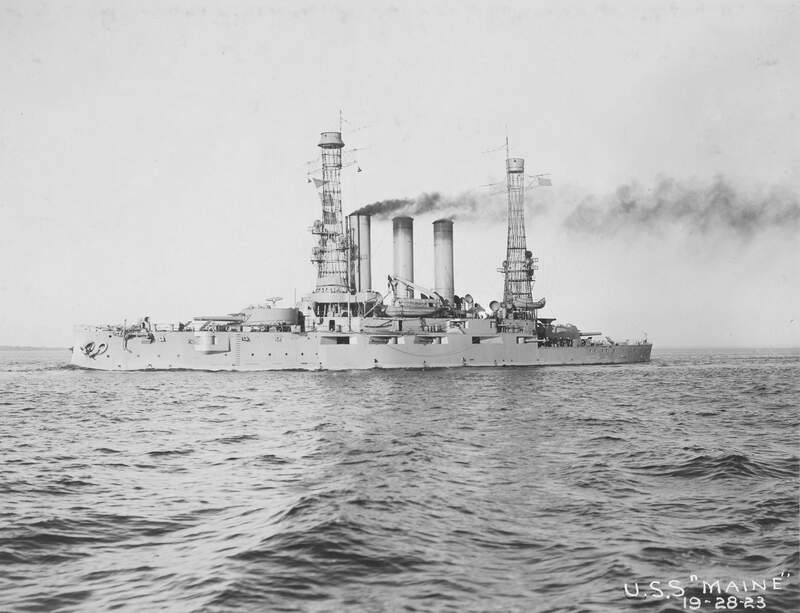 NEW BATTLESHIP MAINE (BB-10), THE LATEST ADDITION TO THE UNITED STATES NAVY, THAT COMES UP TO THE SPEED REQUIREMENT OF EIGHTEEN KNOTS, BUT IS NOT AS SWIFT AS EUROPEAN VESSELS OF THE SAME TYPE Image and text provided by University of California, Riverside. Photo by The San Francisco Call. (San Francisco [Calif.]) 1895-1913, 08 September 1902, Image 4, courtesy of chroniclingamerica.loc.gov. For the first time in the history of the United States Navy, a modern battleship has failed to attain the speed qualifications of her contract. The Maine in her trial over the Cape Ann course last Saturday failed to make 18 knots per hour, as specified in the contract between the Government and William Cramp & Sons of Philadelphia. Image and text provided by University of Hawaii at Manoa; Honolulu, HI. Photo by Evening Bulletin. 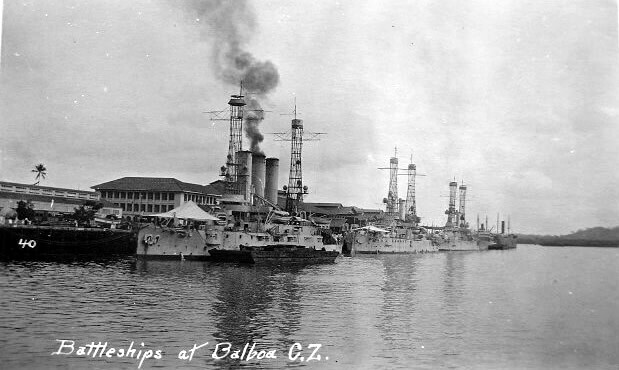 (Honolulu [Oahu, Hawaii) 1895-1912, 13 September 1902, Image 9, courtesy of chroniclingamerica.loc.gov. 890k FIRST COMMANDER OF THE NEW MAINE (BB-10) Image and text provided by University of Hawaii at Manoa; Honolulu, HI. Photo from The Pacific Commercial Advertiser. (Honolulu, Hawaiian Islands) 1885-1921, 27 September 1902, Image 9, via chroniclingamerica.loc.gov. The Maine's (BB-10) Commander Image and text provided by Library of Congress, Washington, D.C.
Photo by The Washington Times. (Washington [D.C.]) 1902-1939, 04 January 1903, Editorials, The Drama, and Society, Image 19, courtesy of chroniclingamerica.loc.gov. 3.10k THE NEW BATTLESHIP MAINE (BB-10). Now fitting out for service in Venezuelan waters. Image and text provided by Library of Congress, Washington, D.C.
Photo by New-York Tribune. (New York [N.Y.]) 1866-1924, 25 January 1903, Image 1, courtesy of chroniclingamerica.loc.gov. NR Here is a picture of the new battleship Maine (BB-10), showing her as she looked in Cramps' yards just after her completion. 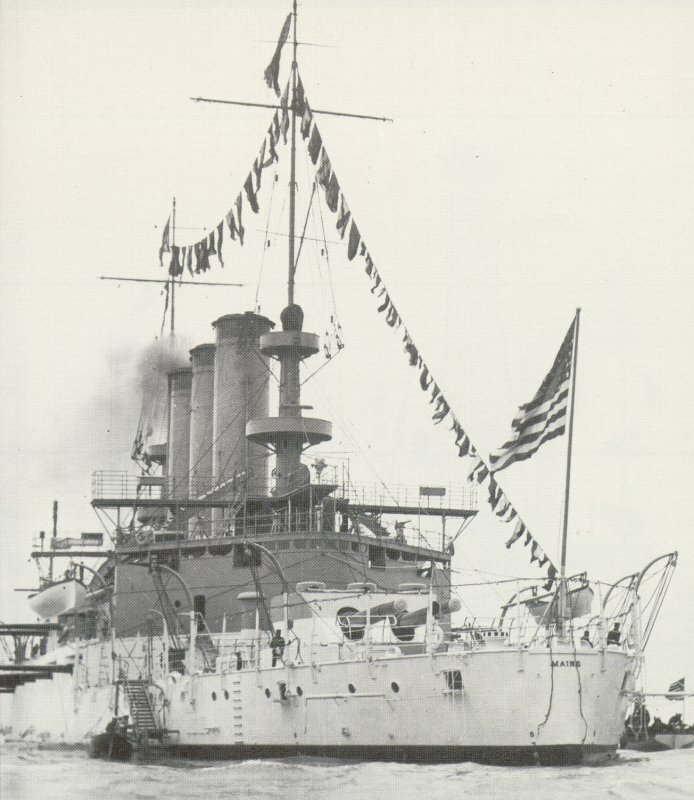 Her namesake was the vessel which brought on the Spanish-American war; if this nation is called upon again to go to war this new vessel will play a prominent part in the proceedings. Not that the government expects a war, but just to be ready in case one of the European powers requires a severe lesson, the new Maine is being prepared for active duty and is now in the very best of condition. Image and text provided by Montana Historical Society; Helena, MT. Photo by The Butte Inter Mountain. (Butte, Mont.) 1901-1912, 31 January 1903, Image 1, courtesy of chroniclingamerica.loc.gov. 71k Panoramic photograph of the ships' Officers & Crew, taken looking aft from her forecastle on 10 February 1903. Maine's (BB-10) Commanding Officer, Captain Eugene H.C. Leutze, is standing just to the left of the 12"/40 gun in the center of the photo. Standing beside Capt. Leutze, to the left, is Lieutenant Commander Thomas S. Rodgers. 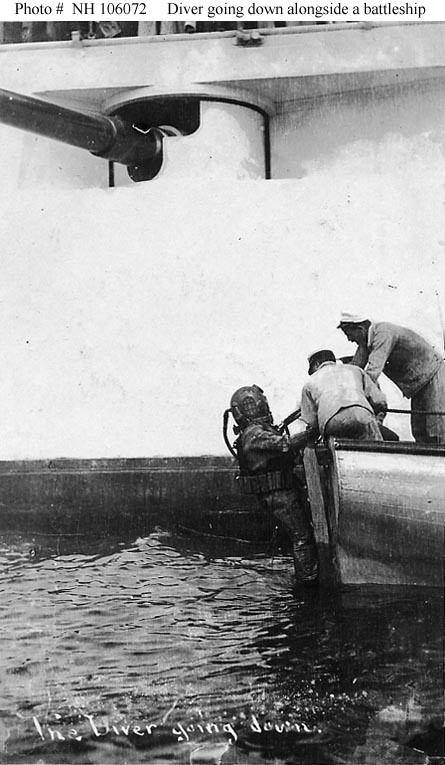 Note items in the foreground, including the capstan, anchor chain, and a pontoon raft. USNHC # 46798. 1.80k BATTLESHIP MAINE (BB-10), WHOSE OFFICERS ARE HAVING CONSIDERABLE DIFFICULTY IN MAINTAINING DISCIPLINE AMONG THE CREW, ACCORDING TO THE PUBLISHED PRESS REPORTS FROM NEWPORT NEWS. WHERE THE CRAFT IS NOW LYING IN DRY DOCK Image and text provided by University of California, Riverside. Photo courtesy of The San Francisco Call. (San Francisco [Calif.]) 1895-1913, 02 March 1903, Image 4, via chroniclingamerica.loc.gov. 2.96k BATTLESHIP MAINE (BB-10), AT ANCHOR OFF LEAGUE ISLAND, LOOKS A FORMIDABLE CRIPPLE Image and text provided by Library of Congress, Washington, DC. Photo courtesy of New-York Tribune. (New York [N.Y.]) 1866-1924, 20 April 1903, Image 3, via chroniclingamerica.loc.gov. 361k A circa 1900's postcard of the Maine (BB-10) drawn by Edward H. Mitchell Publishers of San Francisco, CA. Photo from the collection of Raymond Strout, courtesy of Jonathan Eno. 2.46k BATTLESHIP MAINE (BB-10) ORDERED TO COLON. USNHC # 74103. Photo from New-York Tribune. (New York [N.Y.]) 1866-1924, 09 November 1903, Image 1, via chroniclingamerica.loc.gov. 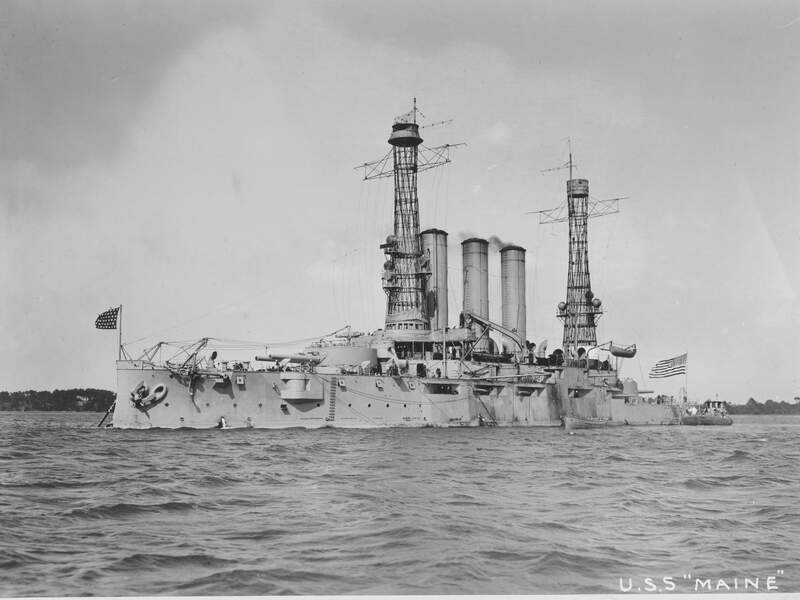 That the Battleship Maine is foreordained to disaster is shown, according to the superstitious sailor in the United States navy, by the latest mishap which has occurred to her. She is lying off Tompkinsville with four ugly cracks in the frames of her boilers. This is the third accident she has met with in two years. Image and text provided by Minnesota Historical Society; Saint Paul, MN. Photo by The Minneapolis Journal. (Minneapolis, Minn.) 1888-1939, 02 January 1904, Section 3, Image 28, courtesy of chroniclingamerica.loc.gov. 413k Maine (BB-10) doing a stationary 18 knots. Photo courtesy of Arnold A. Putnam. 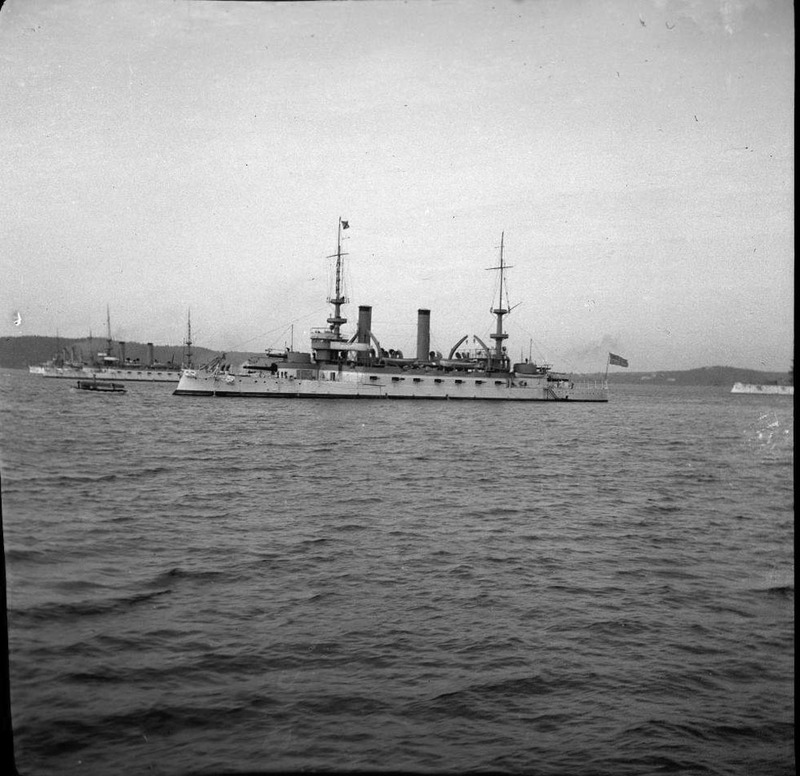 195k The First Squadron of the North Atlantic Fleet during a visit, 3-10 August 1905, to Bar Harbor, Maine. The visit consisted of eight BB's commanded by RA R.D. Evans. 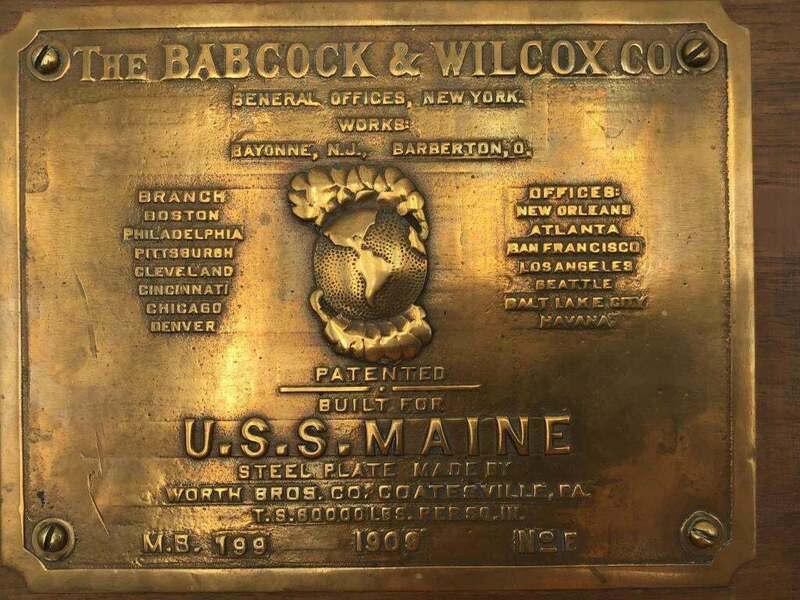 Maine (BB-10), Missouri (BB-11), Kearsarge (BB-5), Kentucky (BB-6), Alabama (BB-8), Illinois (BB-7), Iowa (BB-4), and Massachusetts (BB-2). From right to left are the Kearsarge, Kentucky, Maine & Missouri. Photo from the collection of Raymond Strout via Jonathan Eno. BATTLESHIP MAINE (BB-10) DECORATED FOR CHRISTMAS Image and text provided by University of Nebraska-Lincoln Libraries, Lincoln, NE. Photo by The McCook Tribune. (McCook, Neb.) 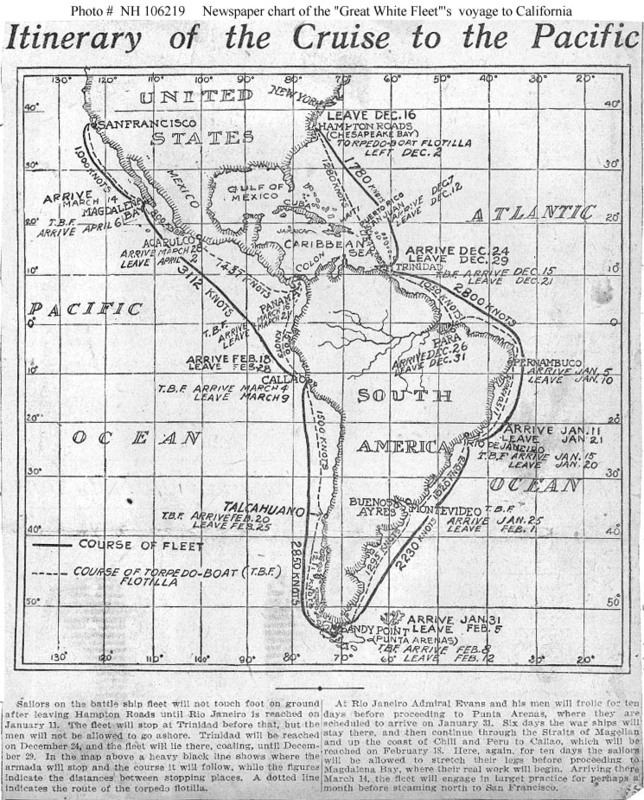 1886-1936, 22 December 1905, Image 6, courtesy of chroniclingamerica.loc.gov. 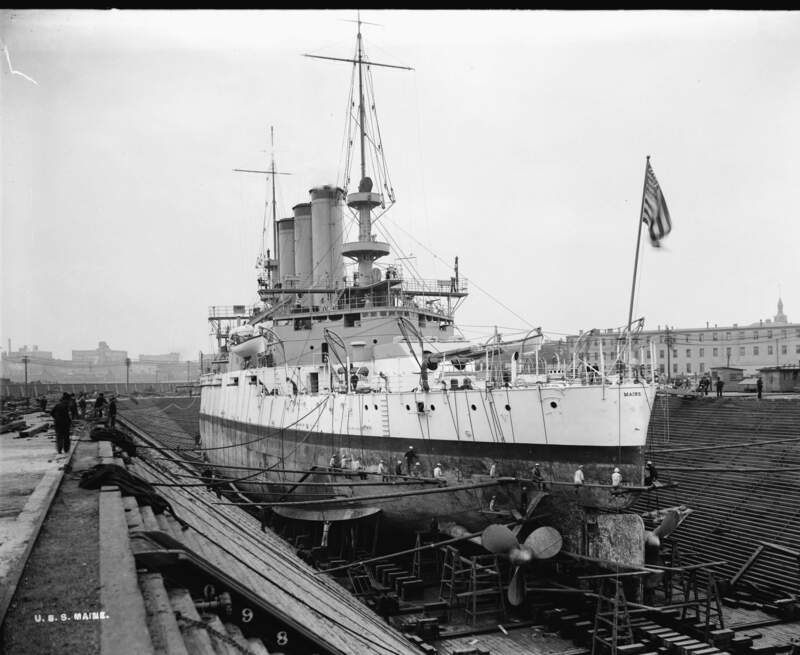 The battleship Maine (BB-10) Image and text provided by Library of Congress, Washington, D.C.
Photo by The Washington Times. (Washington [D.C.]) 1902-1939, 03 September 1906, Last Edition, Image 4, courtesy of chroniclingamerica.loc.gov. 2.24k THE GREAT NAVAL REVIEW AT OYSTER BAY. THE FLAG SHIP MAINE (BB-10) SALUTING. Image and text provided by Library of Congress, Washington, D.C.
Photo by New-York Tribune. (New York [N.Y.]) 1866-1924, 03 & 04 September 1906, Images 2 & 1, courtesy of chroniclingamerica.loc.gov. 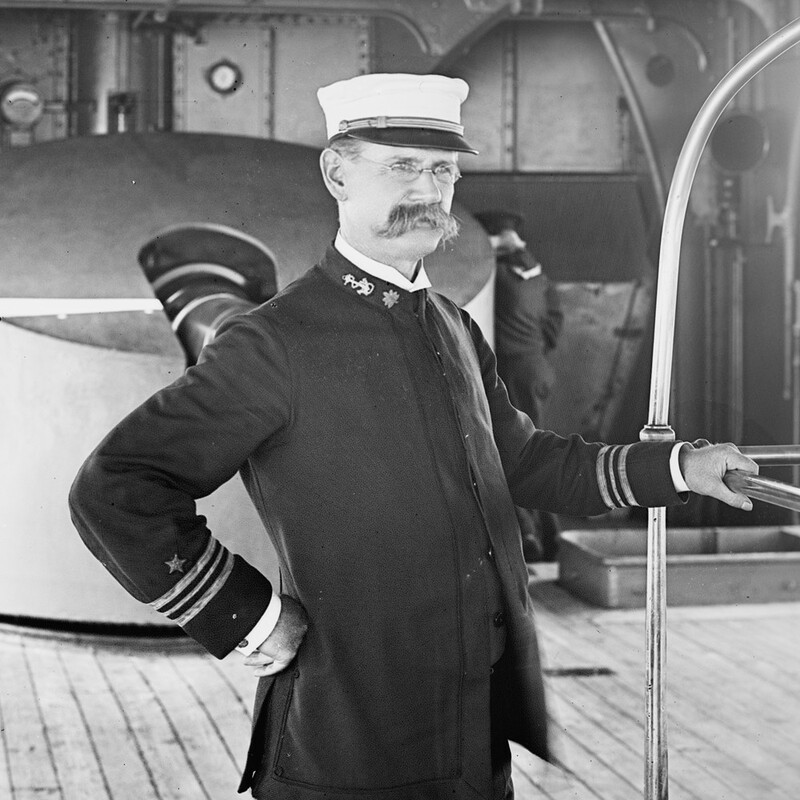 88k The first Commander in Chief of the Atlantic Fleet was Rear Admiral Robley D. Evans, who assumed command on 1 January 1906 aboard his flagship the battleship Maine (BB-10). 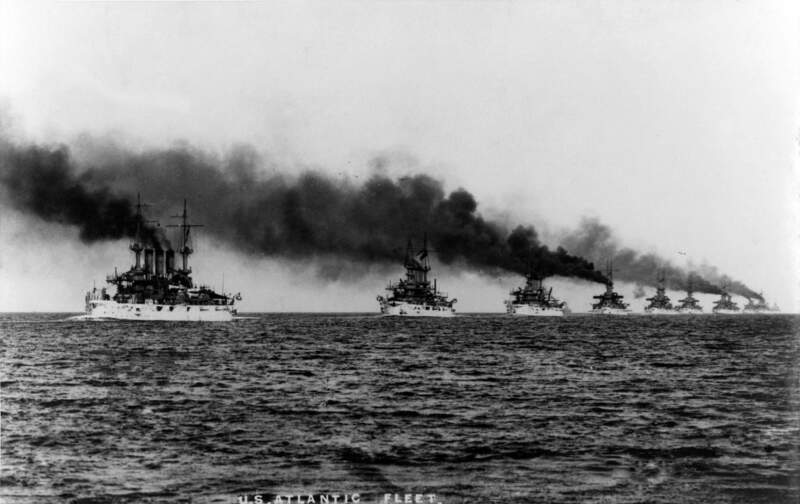 In December 1907, Rear Admiral Evans led the fleet of 16 first line battleships out of Hampton Roads on the start of the famous world cruise of the Great White Fleet (1907-1909). President Roosevelt witnessed the departure from his yacht Mayflower. USNHC photo # 49662 courtesy of Bill Gonyo. 103k Stern view, June 1907. Pt. Comfort Virginia. USNI/USN photo. 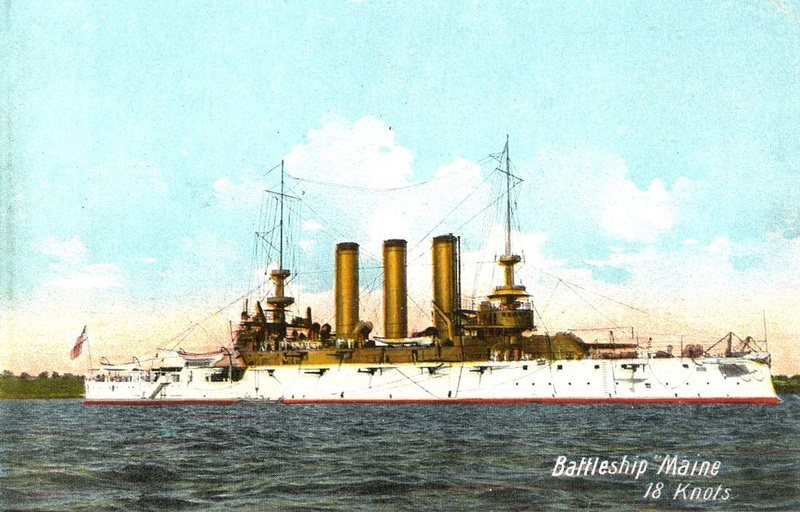 283k The Battle Ship Maine (BB-10), Portland Harbor, Ft Gorges in background - postmark 1907. Photos courtesy of Arnold Putnam. 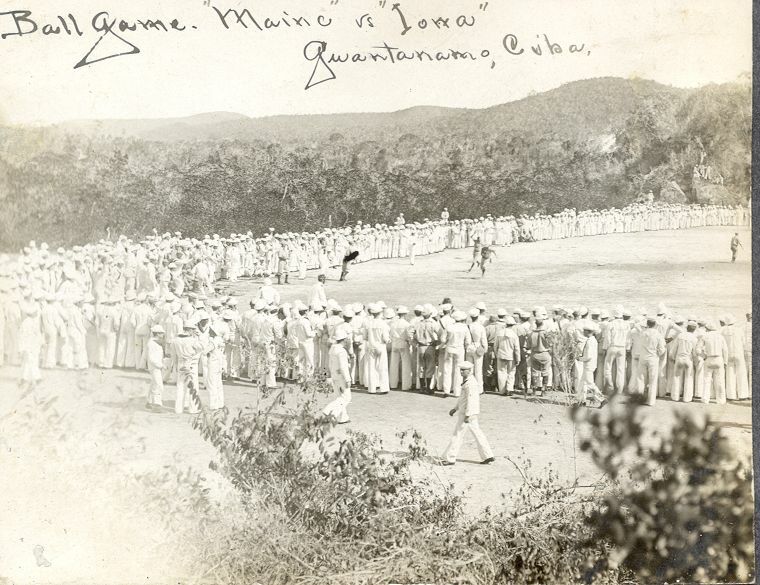 107k Baseball game between the crews of the Iowa (BB-4) and the Maine (BB-10), Guantanamo Bay, Cuba, 1907. From the collection of Capt. Thomas C. Edrington III, USN, courtesy of his daughter Kyra Larn Edrington and son Thomas C. Edrington IV. 338k Stereoscopic color print of the Maine (BB-10) with the 3rd Division of the 2nd Squadron of the "Great White Fleet". Photo courtesy of SK/3 Tommy Trampp. 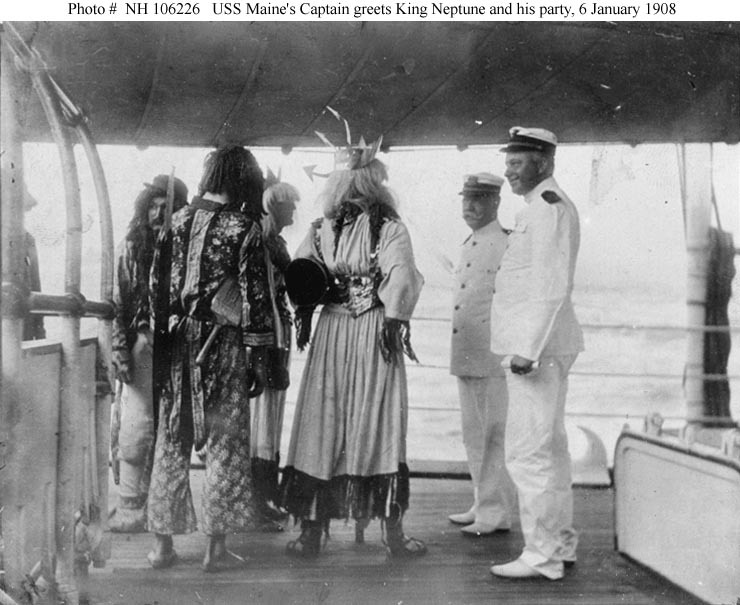 79k The Maine's (BB-10) Commanding Officer, Captain Giles B. Harber (right center, with mustache) greets "King Neptune" (center) and members of the Royal Party at the beginning of Equator crossing ceremonies, 6 January 1908. 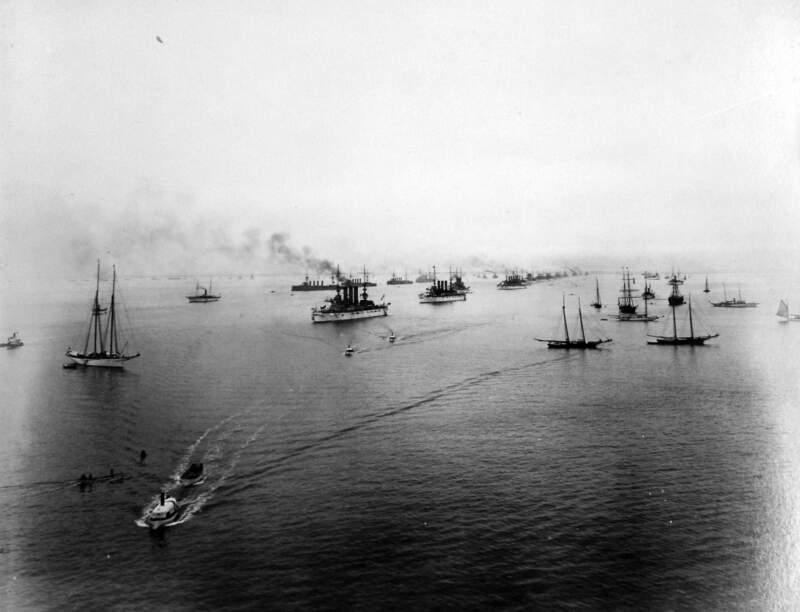 The ship was then steaming south off the Brazilian coast during the "Great White Fleet"'s World cruise. U.S. Naval Historical Center Photograph # NH 106226. Courtesy of the Naval Historical Foundation, Washington, D.C. Collection of Rear Admiral Harold M. Bemis. 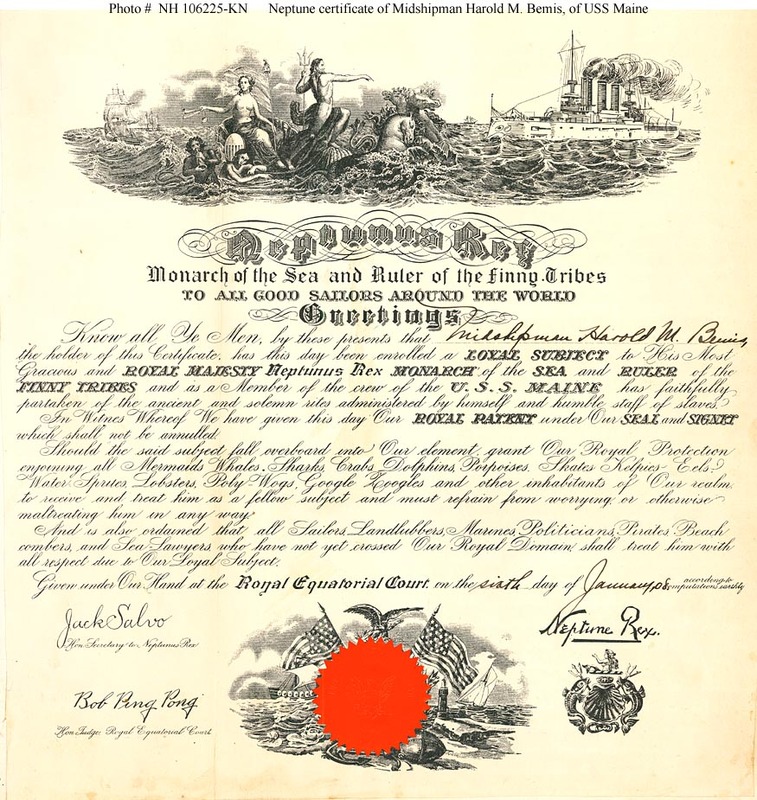 240k Equator Crossing Certificate prepared for Midshipman Harold M. Bemis, of Maine (BB-10), certifying that he had crossed the Equator on 6 January 1908. 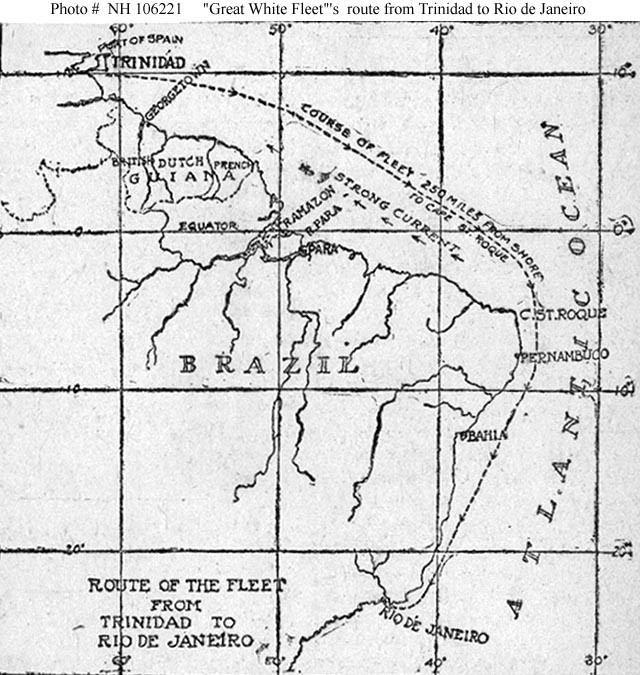 His ship was then steaming south off the Brazilian coast during the "Great White Fleet"'s World cruise. U.S. Naval Historical Center Photograph # NH 106225-KN. Courtesy of the Naval Historical Foundation, Washington, D.C. Collection of Rear Admiral Harold M. Bemis. 93k Burial at sea of Oiler F.A. Tew, on the morning of 23 January 1908, While Maine(BB-10) was steaming in the South Atlantic during the "Great White Fleet"'s World cruise. Tew had died on the previous day, as the ship was preparing to leave Rio de Janeiro, Brazil. 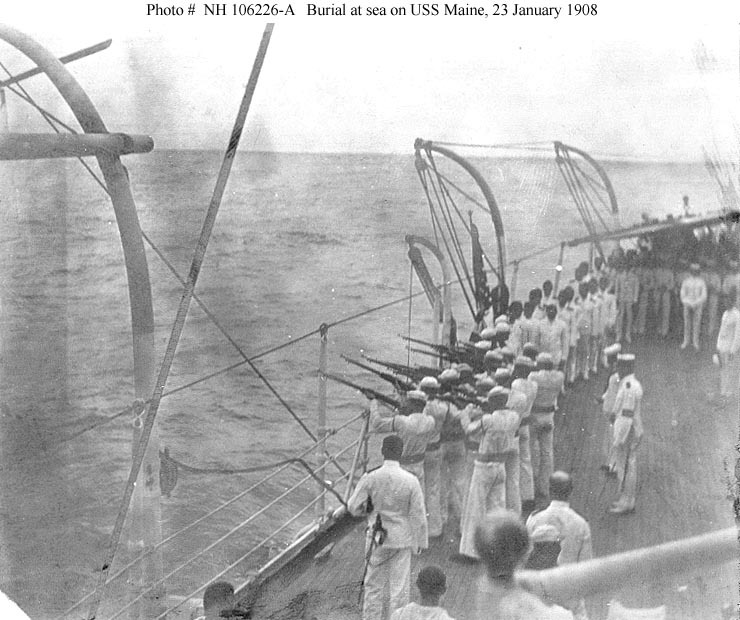 This photograph shows his shipmates firing three volleys with Krag-Jorgensen rifles after the body had been cast into the sea. Midshipman Harold M. Bemis was in charge of the firing party. U.S. Naval Historical Center Photograph # NH 106226a. Courtesy of the Naval Historical Foundation, Washington, D.C. Collection of Rear Admiral Harold M. Bemis. 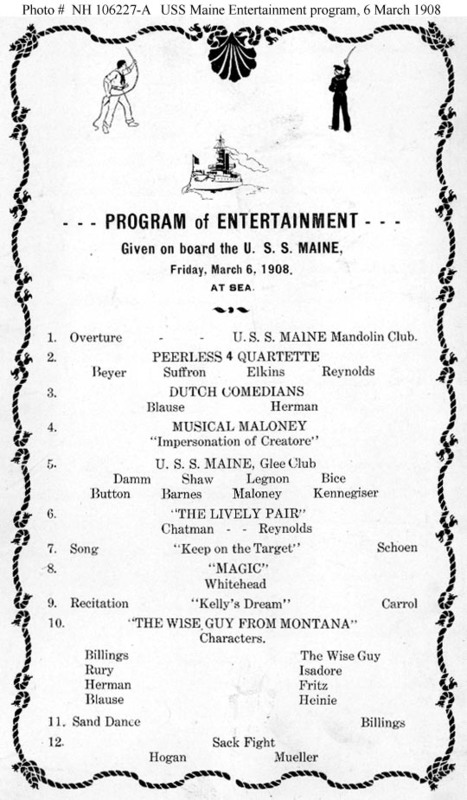 104k Program of an variety show given on board the ship while she was at sea on 6 March 1908, steaming north en route from Callao, Peru to Magdalena Bay, Mexico during the "Great White Fleet"'s World cruise. U.S. Naval Historical Center Photograph # NH 106227a. Courtesy of the Naval Historical Foundation, Washington, D.C. Collection of Rear Admiral Harold M. Bemis. 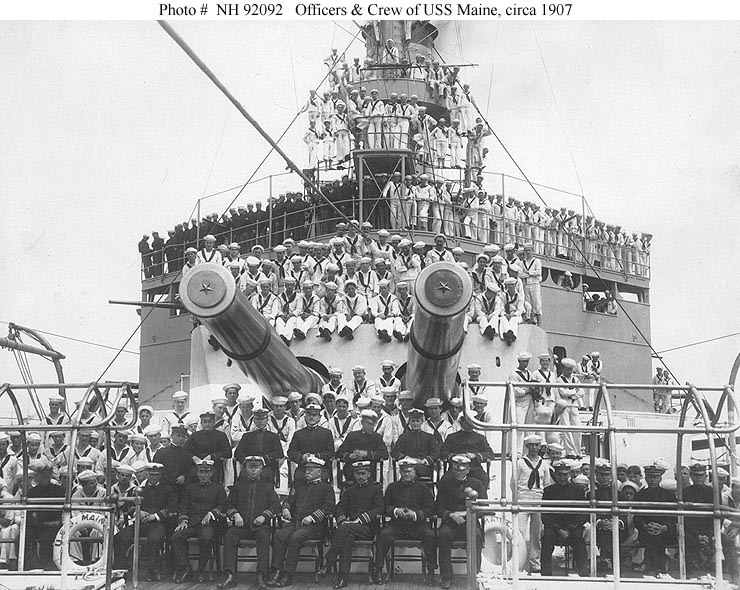 128k Ship's Officers and Crew pose on her foredeck, 12-inch gun turret and superstructure, March 1908, while she was in Magdalena Bay, Mexico during the "Great White Fleet"'s World cruise. The ship's Commanding Officer, Captain Giles B. Harber is seated in the front row, just to the left of center. USNHC # 92092. 114k At anchor, circa 1908 or earlier. Photo printed on a stereographic card, copyrighted in 1908 by Underwood & Underwood. USNHC # 100309. 124k In drydock at Hunter's Point, San Francisco, California, circa 1908. USNHC # 63509. 549k THE BATTLESHIPS MAINE (BB-10) AND ALABAMA (BB-8) HOMEWARD BOUND. Image and text provided by University of Hawaii at Manoa; Honolulu, HI. Photo from The Hawaiian Gazette. (Honolulu [Oahu, Hawaii]) 1865-1918, 19 June 1908, Image 2, via chroniclingamerica.loc.gov. 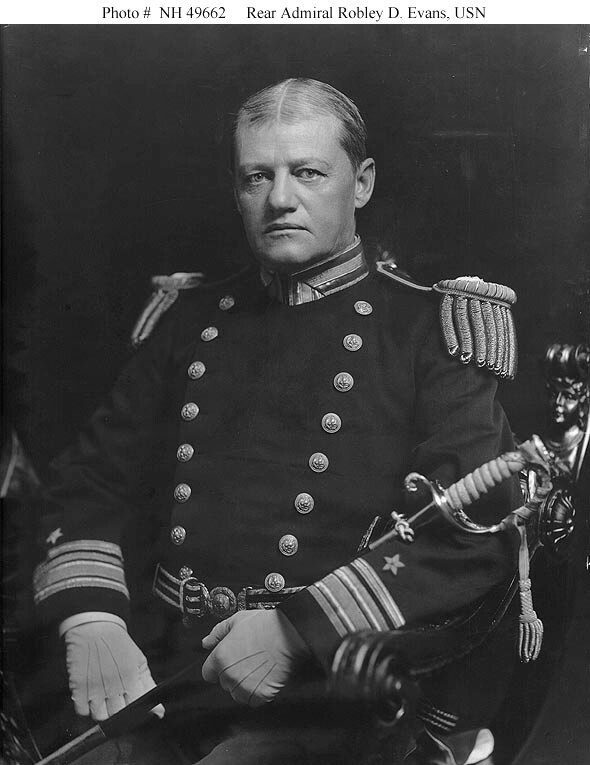 242k Captain Giles B. Harber was Maine's (BB-10) Commanding Officer from 1908 to 1909 following his promotion to Rear Admiral. He assumed the duties of Commanding 3rd squadron, Pacific fleet. 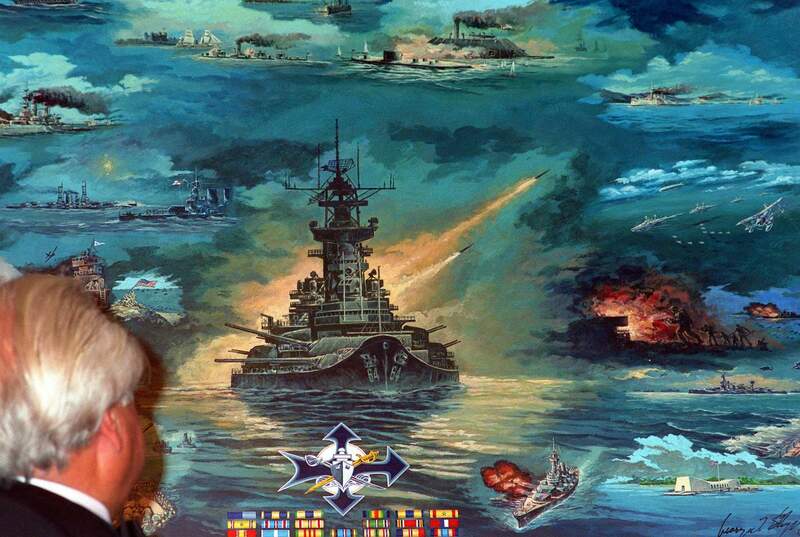 At one point he was the Commander-in-Chief of both the United States Atlantic Fleet and the Pacific Fleet. Photo courtesy of the Library of Congress via Bill Gonyo. 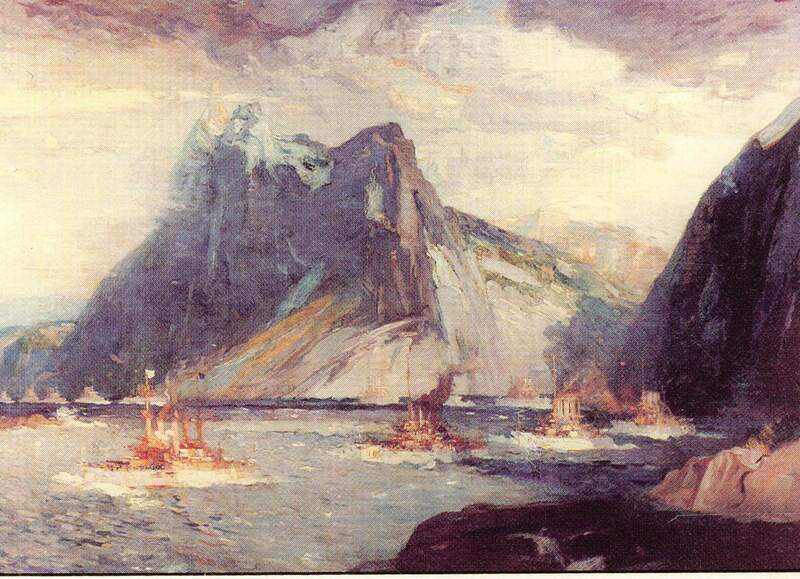 3.14k Following a port call at Gibraltar, Maine (BB-10) and Alabama (BB-8) embarked upon the Atlantic passage on 4 October 1908. They made one stop, in the Azores, on their way across the Atlantic. Maine & Alabama appear here dockside at Ponta Delgada in the Azores. Text courtesy of DANFS. Photo courtesy of Carlos Manuel Estrela via Fabio Pena. 66k Maine (BB-10), photographed by Brown & Shaffer, 1909. USNHC # 101512. 42k Bow on view of the Maine (BB-10), circa 1909. USN / USNI photo. 140k Captain William Banks Caperton assumed command of Denver (C-14/PG-28/CL-16) on 20 April 1907 and transferred his command to Maine (BB-10) on 31 July 1908. 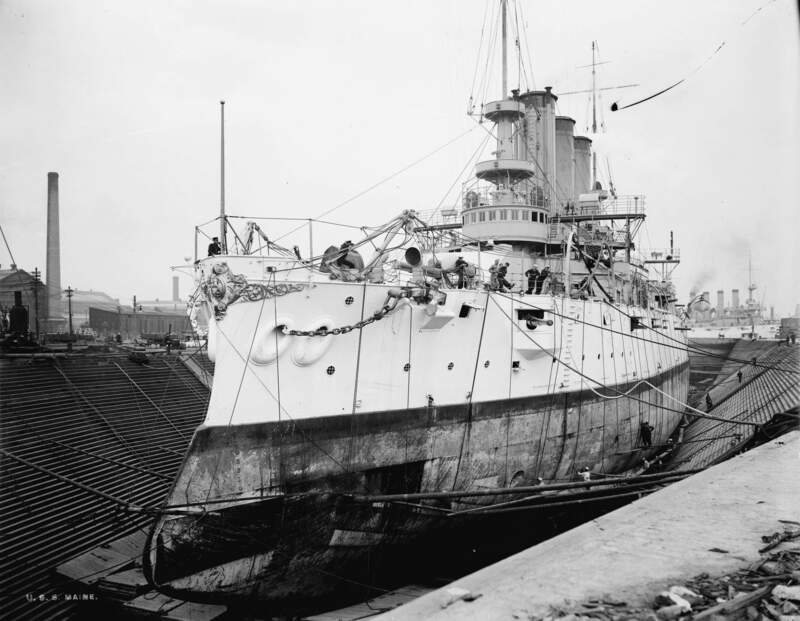 He remained in command until the Maine was decommissioned on 31 August 1909. Digital ID: ggbain # 15823. Source: Library of Congress Prints and Photographs Division, courtesy of Bill Gonyo. 65k Inboard profile of Maine (BB-10) as modernized with cage masts. Note the installation of a central (fire control) station, which the U.S. Navy considered the key to long range gunnery. Photo and text courtesy of U.S. Battleships: An Illustrated Design History by Norman Friedman. 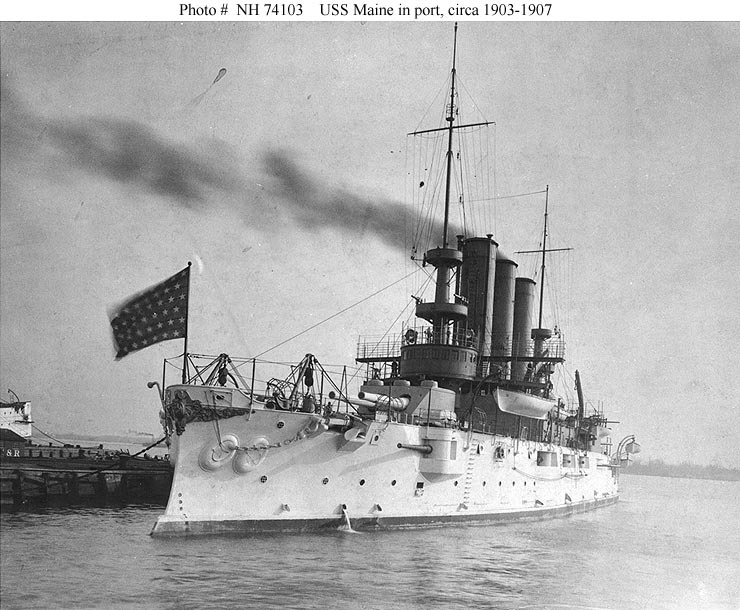 1.16k Recommissioned 15 June 1911, Maine (BB-10) operated along the east coast & appears here on 11 July 1911. Text courtesy of DANFS. 280k Maine (BB-10) in Gotham City, 1911. Digital ID: 2162984429_db453ac5e8_o. LC-B2-2 332-14. Source: Library of Congress Prints and Photographs Division, from the George Grantham Bain Collection, courtesy of Tom Kermen. 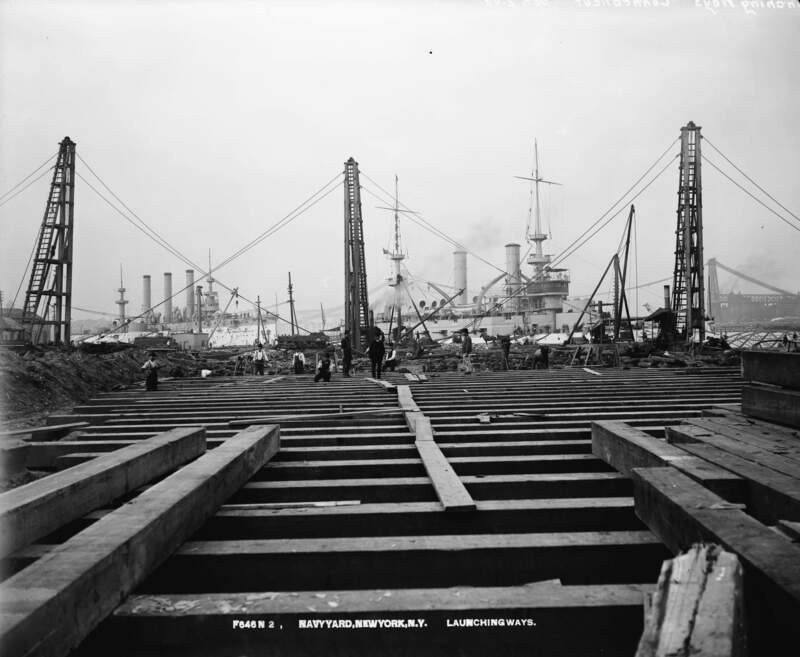 330k Waterfront, Looking Northeast, from Inner End of Coal Plant at Brooklyn Navy Yard, 2 November 1915. The ship is most likely Maine (BB-10). Ohio (BB-12) had a square fore top from the time the cage mast was installed. Both tops on the ship in question are round. Missouri (BB-11) started with round tops, but they were soon square. Also, in this photo, there are tall, prominent mushroom vents on either side just forward of the after turret. Missouri, in the limited views available, either lacked these vents or they are of a less prominent design. But the photos of that area on Missouri are limited and so I can't be totally certain. Photo & text i.d. courtesy of Richard M. Jensen. 280k Crew in dress whites lined up for inspection on the Maine (BB-10), 15 August 1916. During World War I, she trained engineers, armed guard crews, and midshipmen. Digital ID ggbain # 22422v. Source: Library of Congress Prints and Photographs Division, from the George Grantham Bain Collection. 152k 16 August 1916 photo of the Maine (BB-10) as she operated along the east coast. Philadelphia's' landsmen, in common with their brethren from other cities, are learning how to man big sea Uncle Sam's fighters in a month's cruise along the Atlantic coast Image and text provided by Digital ID ggbain # 22465v & Evening Public Ledger (Philadelphia [Pa.]) 1914-1942, 09 September 1916, Night Extra, Image 14, courtesy of chroniclingamerica.loc.gov. Library of Congress Prints and Photographs Division. 885k TEACHING COLUMBIA MEN ON THE WASP TO SHOOT. 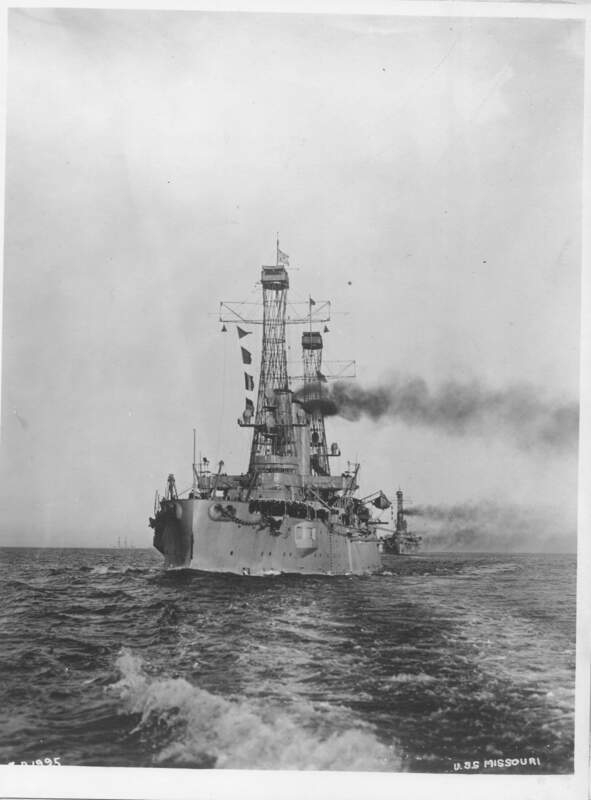 Students unable to leave on the Maine (BB-10) for the training cruise will be put on the battleship at sea from the converted yacht Wasp, aboard which they are learning to handle the 3-inch pieces. Photo from New-York Tribune. (New York [N.Y.]) 1866-1924, 20 August 1916, Image 9, via chroniclingamerica.loc.gov. Civilian fitted out with equipment being accompanied to quarters by officer on Maine (BB-10). 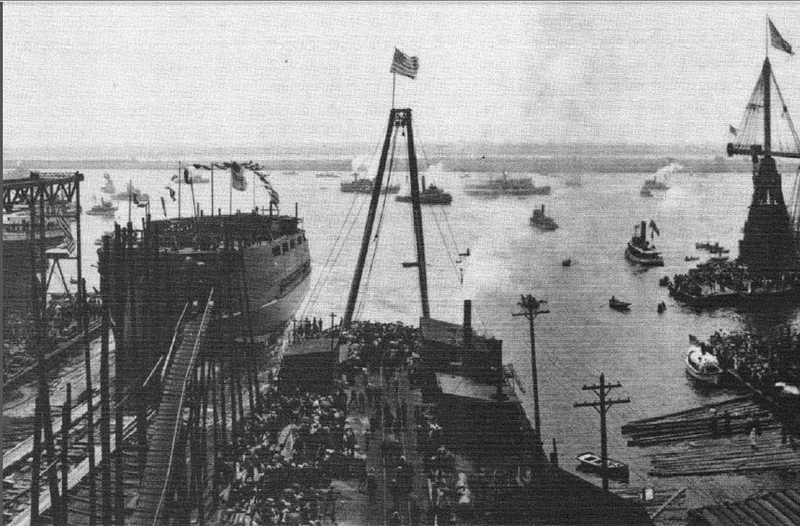 Preperations have been completed at the Brooklyn navy yard for the cruise along the Atlantic coast of about 1,000 civilians. 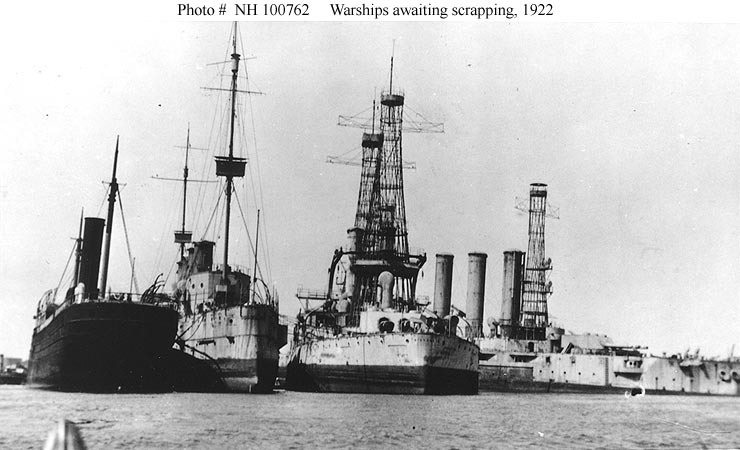 The battleships Maine, New Jersey (BB-16) and Kentucky (BB-6) are in readiness for the citizen sailors. The three ships will be under the command of Rear Admiral Helm, commander of the Atlantic reserve fleet. The saiiors to be will be instructed in the art of handling guns, drilling, fire control system and other essentials. The battleship will go to Gardiner Bay, the cruise will last one month. Image and text provided by Kansas State Historical Society; Topeka, KS. Photo from The Topeka State Journal. (Topeka, Kan.) 1892-1980, 23 August 1916, HOME EDITION, Image 3, via chroniclingamerica.loc.gov. 546k Pipe All Hands on Deck for Grog, Here Come the Rookie Sailor Boys! ...The Maine (BB-10), with the salt water rookies aboard, bloomed white as she rode to sea.... Image and text provided by Library of Congress, Washington, DC. Photo from New-York Tribune. (New York [N.Y.]) 1866-1924, 27 August 1916, Image 54, via chroniclingamerica.loc.gov. 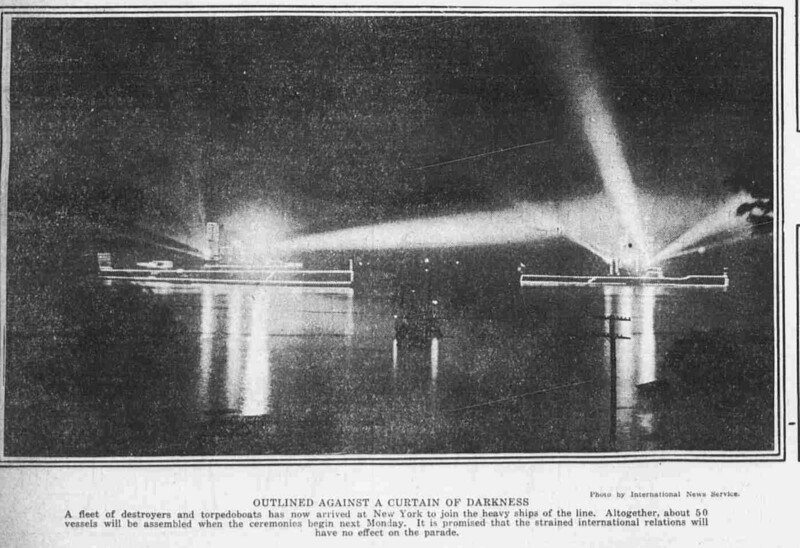 Scenes aboard the battleship Maine, one of the vessels used for the month, training course of naval rookies. The Maine carries a large contingent of Yale, Harvard and Princeton students, many of whom are members of well known families. Among them is Junius Morgan, son of J.P. Morgan, who is seen in the foreground poking out his duffel bag. Image and text provided by Minnesota Historical Society; Saint Paul, MN. Photo from The Tomahawk. (White Earth, Becker County, Minn.) 1903-192?, 31 August 1916, Image 2, via chroniclingamerica.loc.gov. 510k Missouri (BB-11) operating as a training ship, circa 1917. The next ship astern is probably Maine (BB-10). Text courtesy of USNHC # NH 45915. US National Archives photo # 80G-1035067 from NARA, College Park, Maryland, courtesy of Sean Hert. 120k Yacht Atlantis (SP-40) passing the Maine (BB-10), prior to World War I. Photograph USNHC # 95862, by Paul Thompson, New York. 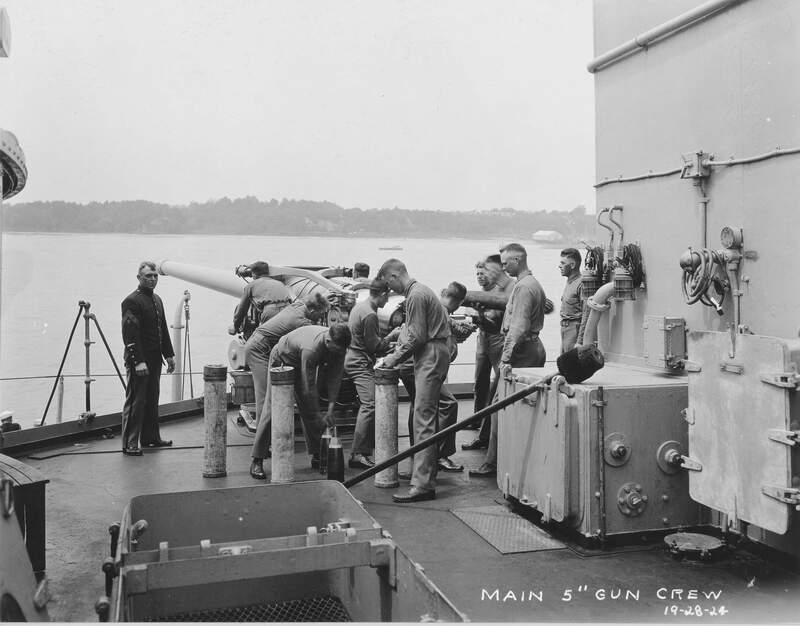 465k Gun Practice - 5" gun crew of the Maine (BB-10), circa 1917-18. 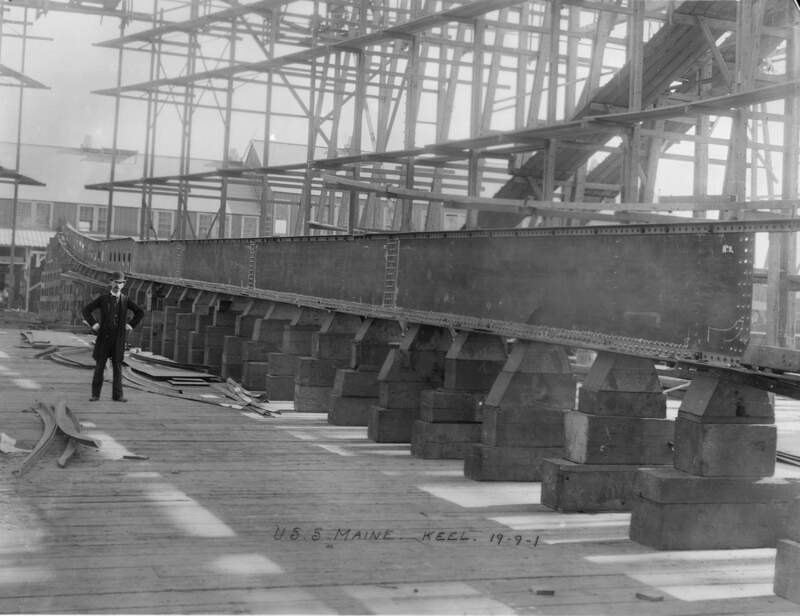 Photographer: Navy Dept., Bureau of Construction & Repair. 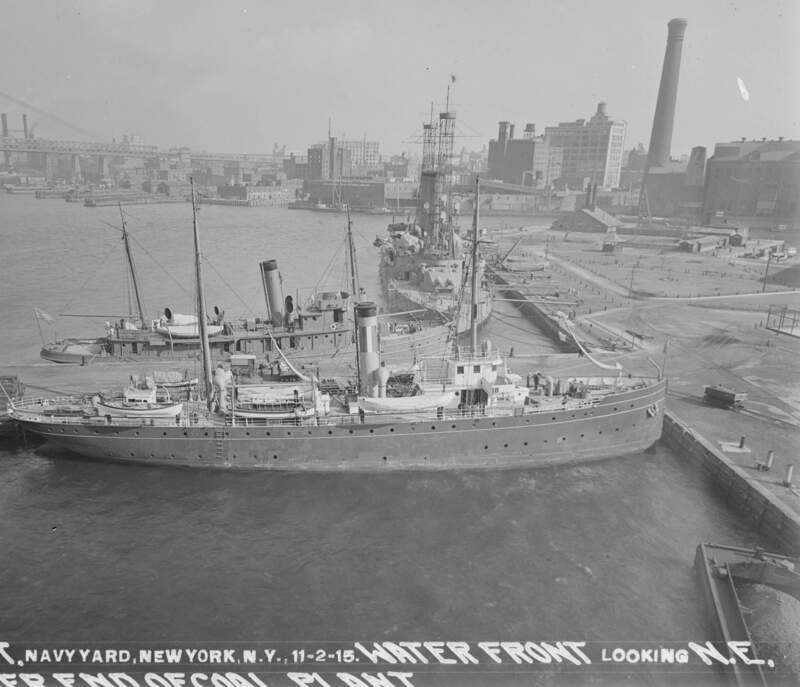 844k Underway, circa 1918, port side view, shows the ship after modernization. This included cage masts, unarmored range finders on her turrets, a minimal bridge, and removal of 6" secondary guns, with the wet ones, forward, completely plated over. Text courtesy of USNHC photo # 19-N-14933. 30k Official Program Fighting Vessels Booklet, 1918, Maine (BB-10),34 pages. 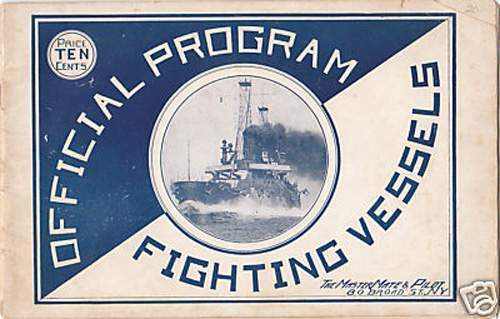 This programme ( 6" X 9 3/8" ) was dedicated for Navy Day Review in New York Harbor December 1918. 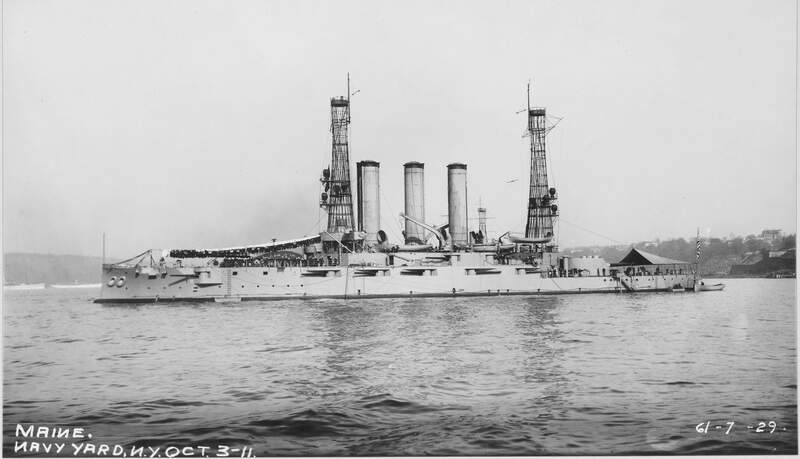 115 Vessels were present, from the presidential yacht Mayflower to the Idaho (BB-42). Pictures include the Wyoming (BB-32), Arkansas (BB-33), Utah (BB-31), Florida (BB-30), South Carolina (BB-26), North Dakota (BB-29), New Hampshire (BB-25), Nebraska (BB-14), Louisiana (BB-19), Mississippi (BB-41), Minnesota (BB-22), Kansas (BB-21), Connecticut (BB-18), Vermont (BB-20), Georgia (BB-15), Michigan (BB-27),Kearsarge (BB-5), New Jersey (BB-16), Virginia (BB-13), Ohio (BB-10), Missouri (BB-11), Kentucky (BB-6), Illinois (BB-7), Rhode Island (BB-17), Alabama (BB-8), Indiana (BB-1), Wisconsin (BB-9), Massachusetts (BB-2), Iowa (BB-4) & Delaware (BB-28). Destroyers McCall (DD-28), Walke (DD-34), Perkins (DD-26), Monaghan (DD-32), Collier Neptune (AC�8), as well as the Submarines Salmon (SS-19), Narwhal (SS-17), Stingray (SS-13) and Tarantula (SS-12). Page shows a Key to Anchorage of all the Vessels in the New York City Harbor, from West 30th to West 170th. Price was Tens cents, printed by Master Mates Pilot, 80 Broad Street, NY City. Photograph & text courtesy of Ron Reeves (of blessed memory). 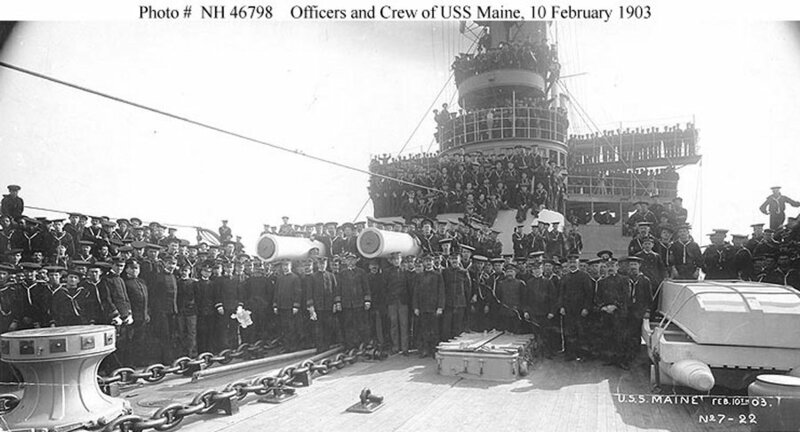 197k Maine's (BB-10) crew. Photo courtesy of SK/3 Tommy Trampp. 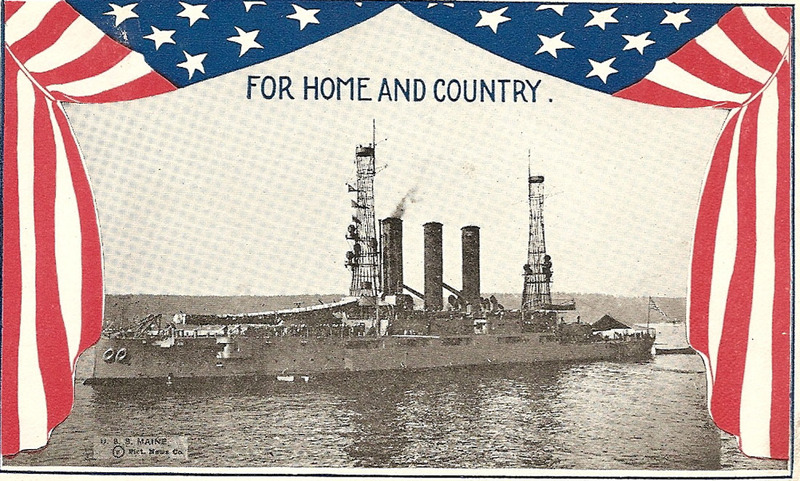 382k Post card of the Maine (BB-10) for Home and Country. Photo courtesy of SK/3 Tommy Trampp. 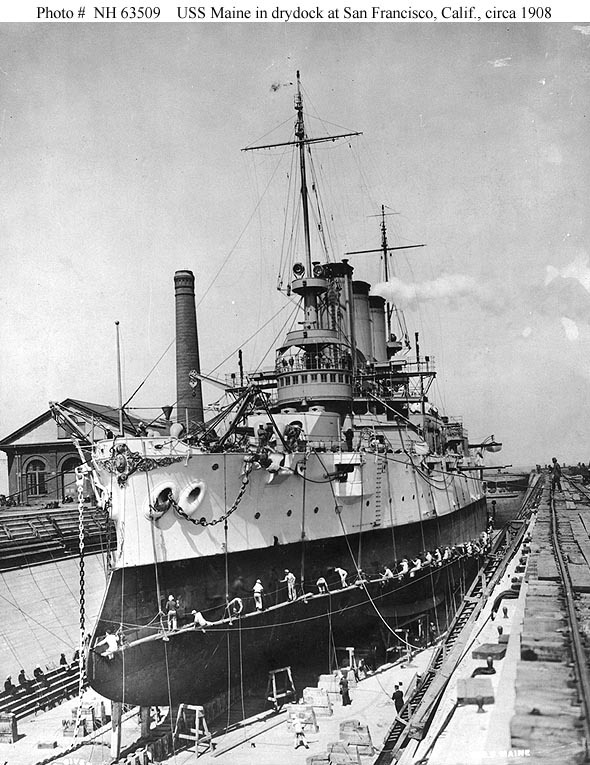 The U. S. battleship Maine (BB-10), as she was being prepared for towing from League Island Navy Yard, Philadelphia, to a commercial yard, where she will be scrapped. Image and text provided by Connecticut State Library, Hartford, CT.
Photo from The Bridgeport Times and Evening Farmer. (Bridgeport, Conn.) 1918-1924, 27 April 1922, Magazine, Image 13, via chroniclingamerica.loc.gov. 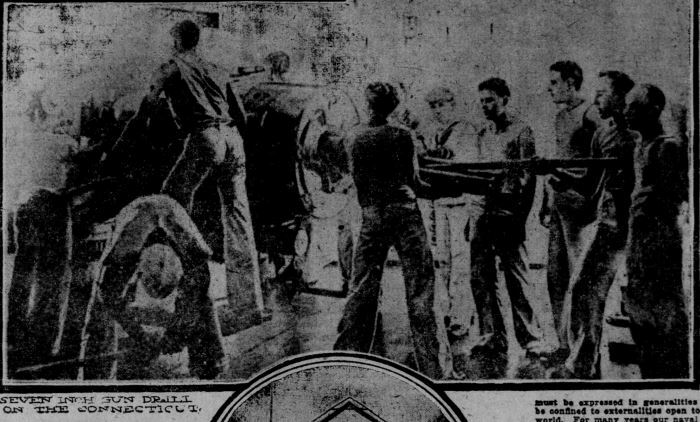 Scene at Philadelphia where Henry A. Hitner sons are scrapping the one-time prides of the United States Navy - a task made necessary by the Limitation of Armament Treaty. The battleships are: left to right - Missouri (BB-11), Maine (BB-10), Wisconsin (BB-9) and Kentucky (BB-6). Photo & text by New-York Tribune. (New York [N.Y.]) 1866-1924, 29 July 1922, Image 16. Image and text provided by Library of Congress, Washington, DC., courtesy of chroniclingamerica.loc.gov.